The Conspiriators of Pleasure will be resident at The Experimental Sounding Board Lab at the University of Brighton in July. 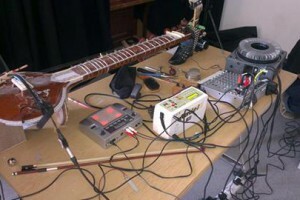 The Experimental Sounding Board is a live platform for performance and mark-making collaborations between sonic and visual modes of improvisation through the exploration of technology and gesture. The project sets out to bring people together within virtual and physical spaces from a range of creative research fields and technical abilities located in different geographical locations. The Experimental Sounding Board opens up a sonically controlled playground by performers, inviting participants to experiment and engage with various forms of technical interventions through exploring gesture and expression via mark-making.